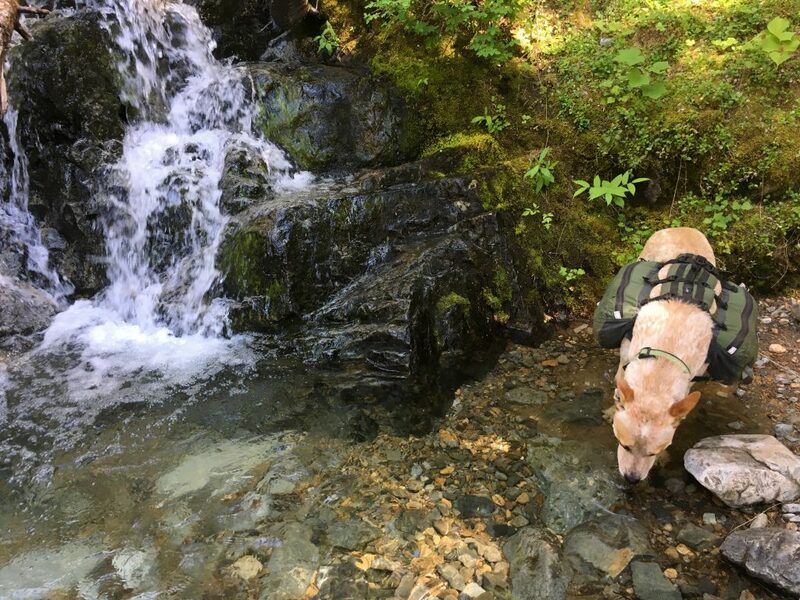 Water on the PCT is by far one of the major challenges for hiking with a dog. Obstacles such as lava rocks and river crossings are serious yet fleeting. Water, however, is a challenge that requires diligence. So what did I do when so many people were telling me I couldn’t physically carry enough water, that the trail was too dry to hike with a dog? I went southbound (SOBO). Hiking southbound is a completely different experience than that of the majority going NOBO. This is especially true if you are a dog. 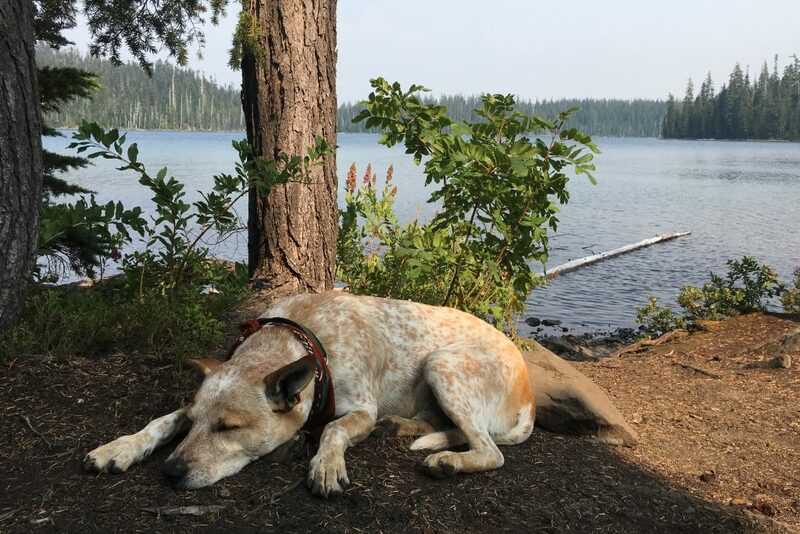 I strongly encourage anyone who wants to hike the PCT with a dog to consider hiking SOBO. For your dogs’ comfort and safety. It will also be easier on you while allowing you to ease into the challenges of thru-hiking with a dog. 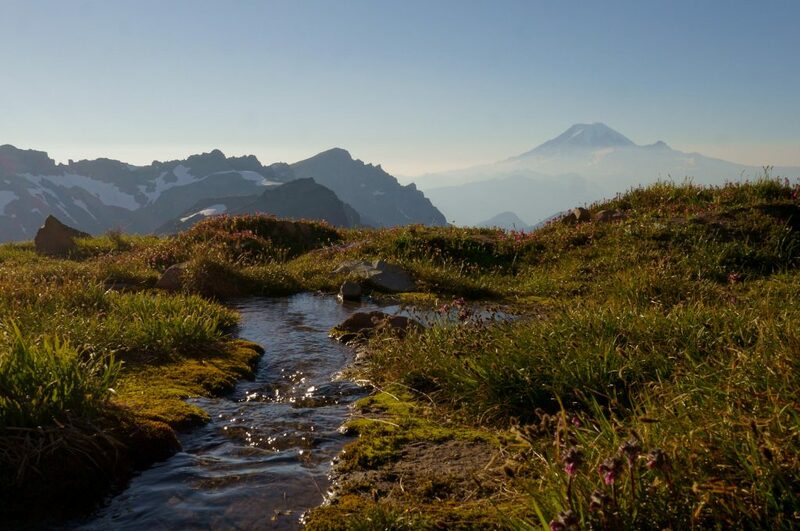 The NOBO hike which most people consider synonymous with hiking the PCT starts out with 700miles of ‘desert’ terrain. It may be more mountainous and vegetated that one tends to imagine when they hear the word desert, but it’s definitely dry. Starting a thru-hike from the southern terminus guarantees heavy water carries from the beginning. Days may become very hot, and good shade can elude one for hours on end. Contrast this to beginning from the Canadian border where there is plenty of shade, cooler days, and most importantly water. For the first couple of weeks on the trail, I don’t recall ever carrying more than 2L of water. Plenty of melting snow, creeks and lakes made it easy for Frank to drink tons of water and stay cool on his own. Washingtons bounty of water allows your dog to get used to life on the trail without the physical stresses of heat and risk of dehydration. It also allows you to build leg strength before you need to carry significant amounts of water. This will help prevent overuse injuries from the start and increase your chances of completing the hike. There are many reasons I recommend a SOBO hike and being able to ease into water carries is high among them. Fresh snowmelt in Washington. A nice bonus to the listed water sources. It wasn’t until south of Snoqualmie Pass that I had to begin carrying water for more than 5 miles at a time. Over the next couple weeks temperatures rose, snowmelt dissipated, and waterless stretches slowly grew. By the time I had to carry water for an entire day both Frank and myself were used to hiking all day every day. I had a good idea of how much Frank would drink for the given terrain and temperature. 20-mile water carries, and hot weather wasn’t easy, but they were certainly easier than without several weeks of conditioning. Throughout most of Oregon, I carried 4-7 litres of water away from each source. Oregon was where we crossed path with the vast majority of NOBO’s so regardless of the direction chosen it’s going to be a similar experience in terms of water. There were a lot of lakes to help Frank cool off in, and even the odd patch of snow left to enjoy. Northern California was, for the most part, significantly cooler than we would have experienced NOBO. There were still days that got quite hot, but our window of cooler hiking temps was longer than it otherwise would have been. Because of this, I found the amount of water needed was similar to Oregon. Instead of sources being primarily streams and lakes there were more springs and water took longer to collect. For the most part, the Sierra was a nice break from heavy water carries. Cold weather and frequent sources helped relieve water weight allowing me to carry the weight of a bear can and much needed extra food. Water wasn’t as bountiful without snowmelt, but all the listed sources were still flowing, and none of them were dangerous to cross. We only got our ankles wet once in crossings. A far safer alternative to the swollen crossings of NOBO season. For those that aren’t aware dogs are not allowed throughout most of the High Sierra. I have included this information for those hiking with a service animal. By the time I got to the desert, we had months of hiking under my belt. My legs had become powerful walking machines. The first week we were subjected to a heat flash, but otherwise, it was cool to comfortable. The terrain felt relatively easy after all the passes in the Sierra, and I had ditched the bear canister. The moderate temperatures reduced our water demands making consistent 20-mile water carries manageable. I was able to carry enough water for Frank to have as much as he wants and cook a hot lunch. It definitely wasn’t a situation where I ‘couldn’t’ carry as much water as was needed. One of my hiking companion in the desert portion hiked NOBO the previous season and said that although there were less available sources he didn’t need to carry near as much water going SOBO. There is a common misconception that the caches are not maintained by the time the SOBO’s arrive. This was absolutely not true. Trail angels have caught on to the growing numbers of SOBOs and were actively maintaining the caches. That said, relying on caches is strongly advised against. Overall, the desert section was no harder than any other. We even enjoyed four rainy days, a snowy summit of Mt.San Jacinto and sat out a flash flood warning. Even with the advantages of hiking southbound I still found myself carrying up to 10 litres at a time in the desert. Much more often than not I walked away from a water source with at least 6 litres. That’s more than 13lbs of water most of the time. If we had walked northbound, I estimate I would have had to carry up to 15 litres. Those 15 litres would have been on top of all of Franks food and pack due to the heat. This would have resulted in carrying loads of up to 80lbs with a full resupply on a hot day. Luckily my decision to hike SOBO meant my pack never weighed much more than 60lbs. Now you may be thinking ‘60lbs? That’s insane!’, and you’re right. It is insane, but that’s what it takes. Obviously, water needs will vary depending on the size of the dog. It will be heavy regardless. 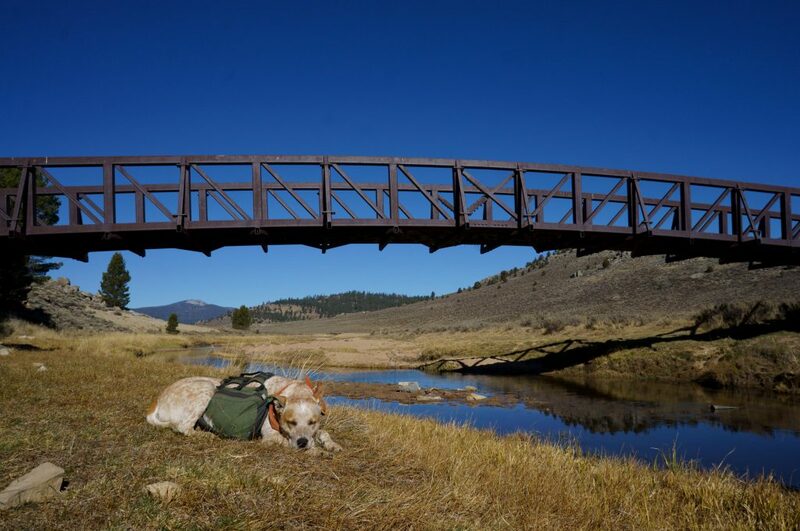 In order to do the daily mileage needed to thru-hike, you will likely need to take all your dogs weight at times. Your options are to carry everything to cover ground or risk serious harm to your dog. At least this is how I see it based on my personal values involving the treatment of animals. Frank is an Australian cattle dog mix who weighs around 70lbs. He has a light coloured and short hair coat. His breed was designed to work all day in the heat. Despite this, he still consumed as much water as me over a 24 hour period. This includes the water I use for coffee and cooking. That meant however much water I needed for myself I would generally need to carry double that amount. Frank never carried water. Not once the entire trail. My reasoning is two-fold. First of all, his food weight was already more than he should carry at times. During the times he had less food I wanted him to be able to enjoy a break from a full load. These times where he carried less were opportunities to do more miles, move faster, or allow him to recover. I didn’t need him to carry water when he otherwise would have been able to because I also had less overall weight. Since I was used to carrying all the water with a full load, it was easy to continue carrying it instead of transferring the burden to Frank. My motto was that he should always be having a better time than me. This was an easy way to ensure he was. The second reason I always carried the water was to ensure it’s safety. I absolutely could not risk him spilling any water. As well behaved as Frank is, it only takes a moment for him to rub against a tree or rock and risk damage to a water vessel. Yes, the chance of that happening is slim. It’s a risk I’m not willing to take when it’s 20 miles between water sources or blazing hot out. There are many scenarios I can imagine where losing water would be less than ideal. Some people have the misconception that because dogs don’t sweat their water needs are less. This is entirely not true. They can respire multiple litres of water over a 24 hour period. A surprising amount drips off their tongues as they pant. 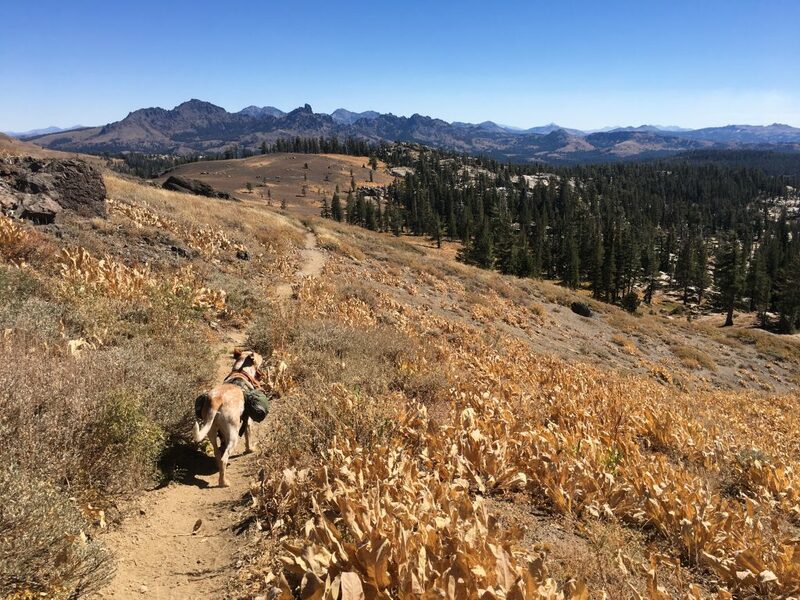 During the hottest days on the PCT, I could feel drops of watery saliva splashing off his tongue and onto my calf as he followed closely behind. Being adequately hydrated is important for a healthy dog, and it helps them regulate body temperature. I had no plan when I began the trail aside from just being strong enough to carry tons of water. Coming from the Coast Mountains, I knew that how we managed water would have to change along the way. This is the system that emerged from my experience to ensure Frank remained as healthy and comfortable as possible within the confines of a thru-hike. 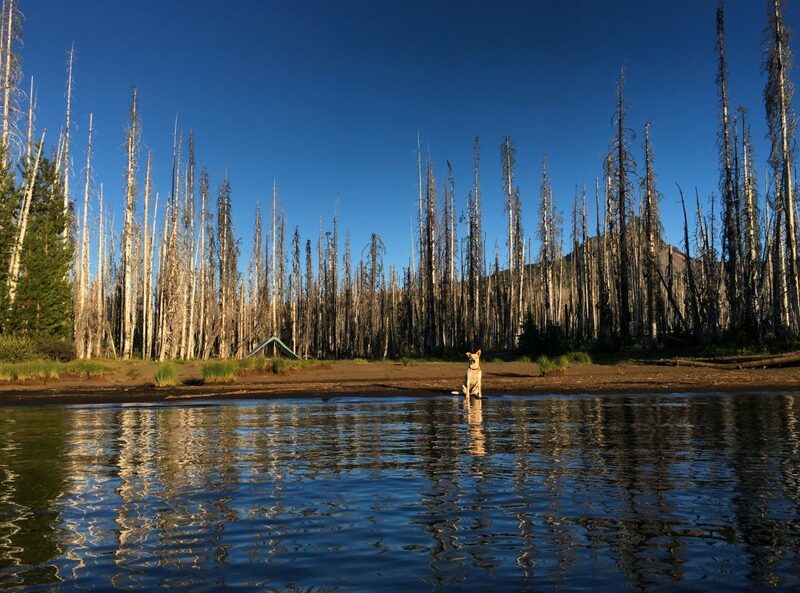 Below I will share a summary of my general guidelines for water on the PCT with a dog. 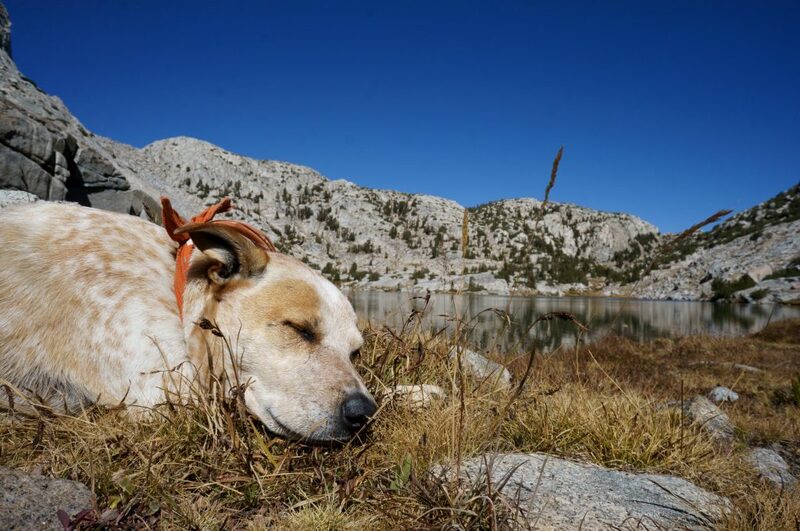 I hope these tips and suggestions help you have a safe time with your dog no matter how far you are hiking. 1) HIKE SOUTHBOUND. For those that didn’t read the entire section on my water experience, it’s kind of important. Hiking southbound definitely takes the water challenge down a notch. It will increase your chances of success and be a more enjoyable experience for your dog. A flip-flop hike is also worth considering in order to minimize the challenges you will face. Don’t worry the trail will challenge you, don’t make unnecessary ones. 2) NO RUSHING. I always stop to let Frank drink from the natural sources we walk past. I stand by as he drinks waiting to move until he has finished and has walked away himself. Sometimes he will pause for a while between drinks. If I walked away he would follow me, and not resume drinking as he would have had I waited. Many sources cross the trail, so if I get to them first I will stop and offer Frank a drink. This assures Frank he can drink without the risk of being left behind. If the water source if off trail I will walk over to it offering him a drink. Even if he is thirsty, he won’t always leave my side to go for water. Being patient while your dog hydrates is a perfect opportunity to observe your dog. Check in with them, and allow the water a moment to settle before continuing down the trail. Gathering water can at times be a lengthy process so enjoy some packs off time. 3) DRINK OFTEN. 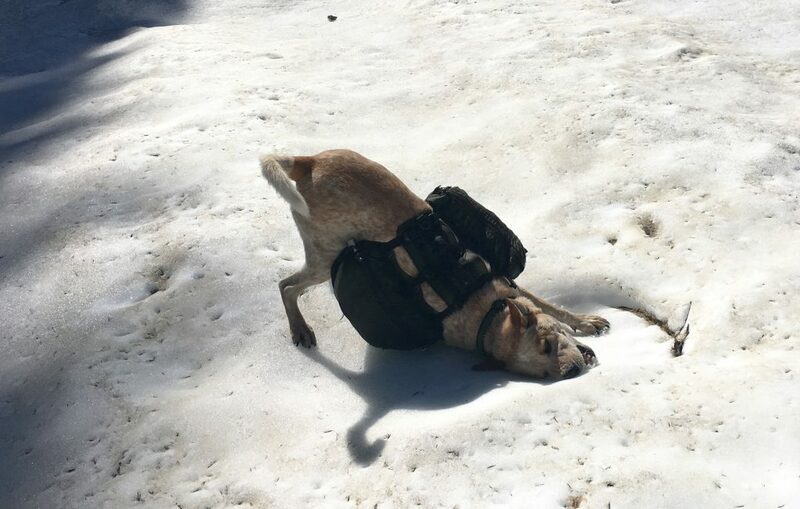 Waterless stretches on the PCT require you to stop and offer water to your dog. Your frequency of stops will range depending on conditions. During the hottest times on the trail, I would stop every 30 minutes to offer Frank water. Almost every stop he would consume 1-2 cups and occasionally more. That works out to nearly a litre every 3 miles. For a 12 miles stretch in the heat, I would carry 4 litres for him spending nearly an hour stopped just for him to drink water. So instead of 12 miles taking 4 hours, it would take a minimum of 5 hours. Usually, it would take longer as I would be moving slowly in the heat with a heavy load carrying his pack. As I’m sure you can imagine this type of schedule doesn’t work well for most thru-hikers. You may find yourself alone, as I did, in order to do what is best for your dog. In cooler weather, I would walk up to 5 miles before stopping for water. Many times I have witnessed Frank take down an entire litre at once even with frequent stops or cool weather. 4) CARRY PLENTY. My general rule of thumb was to carry double my own water needs. Only twice did I ever arrive at a source with nothing on hand. My goal was to never completely run out. Generally for a thru-hiker to arrive at a source with water is taken to mean they’ve carried too much; not with a dog. I know Frank well enough to know his water intake can fluctuate significantly. I prefer ensuring there is always a small reserve. This is often accomplished at the expense of my own intake. 5) CAMEL UP. Stopping to give your dog water can add up to hours a day. Whenever possible take breaks and camp near water so they can have more time to hydrate on their own terms. Frank will often wake in the night and drink up to a litre of water. Camping near water sources greatly reduces the amount of water I need to carry. There are times where dry-camping is unavoidable but with careful planning, you can keep water weight to a minimum. It may not look like it but this evening in Oregon was super hot, so naturally I was carrying all of Franks food and pack. 6) MAKE IT EASY. One way I help Frank stay hydrated is to soak his food in water. Often by the end of the day, he is so tired he just wants to sleep and eat more than anything else. Letting a cup of water soak into his food helps him get more water while making his food more filling and easier to chew. I always leave a bowl of water out for him next to our tent, even if I can hear the water source. I want him to be able to drink with as little effort as possible in camp without being deterred by a little walk. 7) DOG DRINKS FIRST. When we stop for water I give some to Frank before drinking myself. If we are running low I will save what’s left for him. If one of us is going to be thirsty it’s me. It was my choice to hike the trail, and therefore my challenge. It is my duty to him to make every effort for his comfort and safety. 8) PREPARE YOURSELF. The moment you decide to hike the PCT put a 10L water bladder in your daily backpack. Get used to the added base weight on all your day hikes, and while on overnight trips carry all the luxury items you want. The extra weight over that many miles is really hard on the body and thorough conditioning will be appreciated on the trail. Anything you can do to strengthen your back, shoulders, and feet will also be beneficial. I suffered painful plantar fasciitis most of the trail and found good insoles and a light massage ball went a long way. Try to get your own base weight down as much as possible because water and dog food is heavy. 9) KNOW YOUR DOG. Having a understanding of your dogs water needs for different temperatures, activity levels, terrain types, time of day, etc. will help you carry enough, but not way too much water. This is very hard to learn when dogs are used to drinking from a bottomless source in a house. 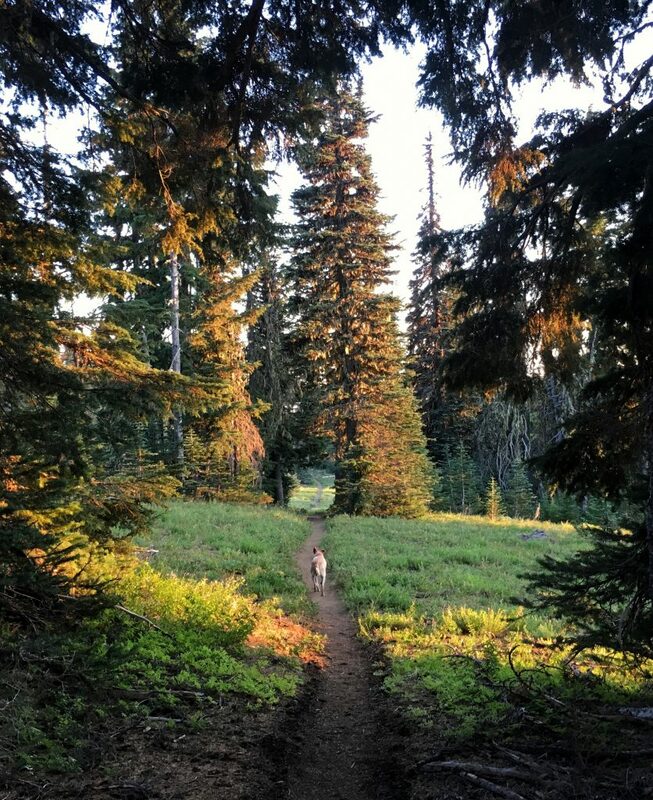 It’s impoartant to have a lot of trail time underfoot, and a close communicative relationship before embarking on a long journey such as the PCT. Everyday is a new day so no matter how well you think you know your dog be open to cues that they may need something out of the ordinary. 10) WATER TREATMENT. I never once filtered Franks water on the PCT. Living in a van most of his life he has primarily drank untreated, wild water. He has a very robust system and has never experienced illness due to water. Water sources tended to be rather fresh, but I was still mindful of potential contaminants such as chemicals from human activity. Helping Frank stay super hydrated meant he was never desperate when arriving at a souce and I was able to judge if I wanted him to stay away from it. There were sources in the desert that I chose not to use for either of us, but had it been necessary I would have filtered for him as well. Obviously water born pathogens are not visible, and all dogs respond differently so it’s important to know your dog and use your best judgement. 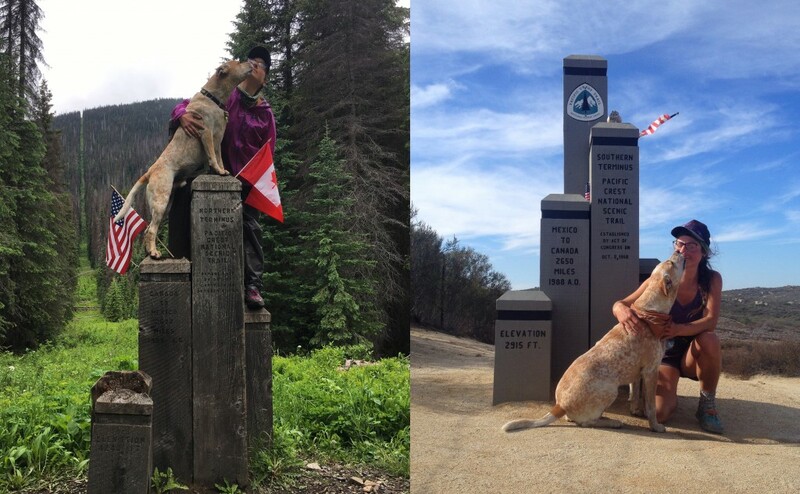 Thru-hiking the Pacific Crest Trail with a dog is a monumental challenge; water being only a small part of it. I will never suggest that someone attempts it, and in most cases would caution against it. Our story is a rare success that resulted from numerous conditions aligning in our favour. For those that choose to try despite all the cautions, I will do my best to share our experience. Next up I will share about Franks food on the PCT. 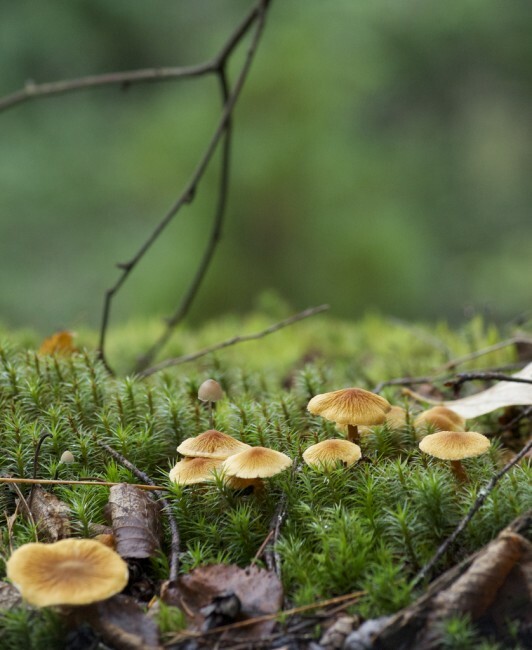 Whether you are planning to backpack for months or a single night there will be valuable information for a happy and healthy time on the trail. 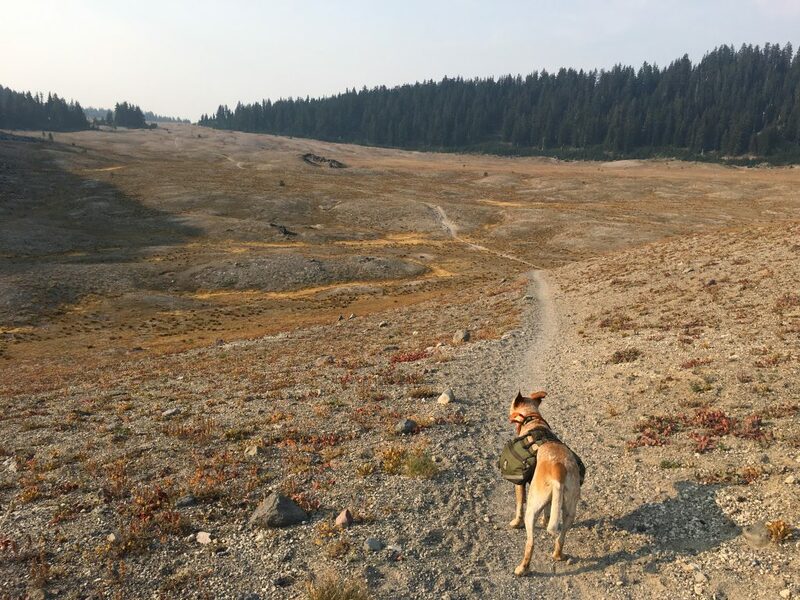 If you haven’t read the first part of this series on hiking the PCT with a dog you can read about our preparations HERE.